Advisers with client money in active funds may have more work to do during periods of sharemarket volatility than those whose clients pursue passive strategies, NZX head of funds management Hugh Stevens says. 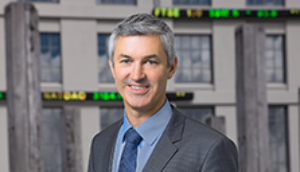 Smartshares released data showing that, across the four key strategies for New Zealand investors, active managers underperformed in October. Stevens said the same looked to have been true of November, too. He said a growing number of retail investors clearly understood passive investment strategies, as demonstrated by the growth of platforms Sharesies and InvestNow. They factored in cost as an important part of their investment plans, he said. Passive investors had got the message that their investments would follow market movements up and down, he said, and were prepared for market turbulence. By contrast, active investors might have higher expectations of their managers - and could be disappointed. He pointed to international research that showed that through periods of volatility there were bigger outflows from active funds. Advisers would have a role as a psychological coach for clients, helping them stick to their plans through market wobbles, he said. New Zealand is still lagging international trends with only 2.6% of open-ended fund assets in passive investments, compared to about 20% globally. Stevens said many advisers had traditionally seen a role in stock selection but research indicated that their value for consumers would come from the choices they made about asset allocation. Let me see: protection on downside, market timing, superior stock picking, strategic asset allocation - yeah nah. Think I’ll stick with a low cost, broadly diversified, evidenced based strategy thanks. Unlike some of my competitors, I can only work with reality. More nonsense statements, filled of vested interest, attempting to flog over-priced passive investments. An alternative is for advisers to construct meaningful portfolios that are relevant for clients (ie: comprise of relevant investments that meet bespoke risk & fee budgets), that are built via a defend-able process, and are monitored periodically. If this sounds like hard work - then this is probably the wrong industry for you. Pragmatic, I'm not sure what parallel universe you are from but from what I see most days of the week, is advisers flogging over-priced active management with far from index performance. All because they believe throwing their clients under a bus with additional risk justifies their own existence. I don't personally rely on tracker funds but I certainly don't believe my value comes solely with portfolio construction. Although important, that is a very small part of a much wider relationship I have with my clients.